If you’ve been reading or watching the news recently you’ll no doubt have heard about the Heartbleed bug that’s been widely reported. It’s a vulnerability in the OpenSSL library that many websites use to enable the SSL/TLS encryption that secures your traffic to that site, keeping your passwords and credit card information safe. It’s probably about time to go and update all your passwords (although you should wait until the site tells you to, because they need to patch the bug and reissue their SSL certificates before they’re properly protected and not all sites will have done this yet), but all this coincidentally comes when I’m in the midst of a plan to get my digital life in order. There are a couple of things I’ve done recently that, in truth, I should have done a long time ago – and you should do them too. First of all, an experiment: raise your hand if you think backing up your data to a remote location is a good idea, or perhaps even an essential practice. OK? Now keep your hand raised if actually do this. Right, that’s what I thought. Until the start of this month I would also have sheepishly lowered my hand at the second question. At home we have a server that handles the syncing of documents between our several computers – the result being that all those really important files exist in a few places, including the server itself. That’s not bad, but if there were some kind of catastrophe affecting our home then everything would be lost because it’s all in one physical location. And it gets worse. The server has a 1TB drive that was big enough to back up all our photos, video and music when I bought it. It’s still big enough to hold all that stuff, but as our collection of digital assets like that has grown there’s no longer room on the individual computers to store everything. Not a big deal – all that stuff is on the server anyway and we can just stream it to whatever device we want to play things on. Fine, except now there’s only one copy of all our photos and music. If the drive in the server failed we’d lose all that stuff. For me that’s more than a decade of pictures. In the past I’ve been unwilling to spend the money necessary to get enough cloud backup space to put all this stuff in, but prices have dropped recently (which really is what prompted me to look at my needs) and anyway, this really is something worth paying for. I got myself 100GB of online storage from ADrive. I don’t know that I’d recommend them for everyone because the transfer speed I get when I upload stuff is pretty slow, but for me it’s perfect: they’re a good price ($25 a year) and I can upload files using rsync, which means it’s extremely easy for me to set up automated backup jobs on our server without needing to install anything. I don’t really need a super-fast transfer speed because my future backup jobs will be incremental (only uploading files that have changed) and syncing documents between computers is not a need - we already have that. 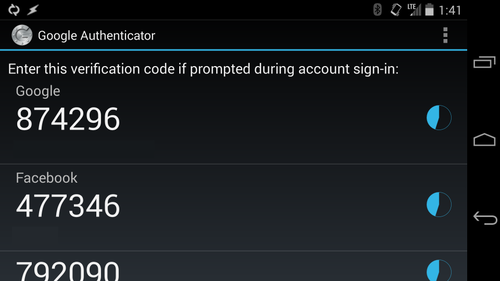 The other big upgrade to my digital life recently has been two-factor authentication. I’ve known of it for a while, although I hadn’t used it at all until recently. Basically though it’s for website logins, and the two factors it talks of are something you know (your password) and something you have (your cell phone). I’ve turned on two-factor authentication wherever I could, using the Google Authenticator app from the play store where possible, and text messaging elsewhere. Essentially the way this works is that when you sign in to a website using your username and password, you’re prompted to enter a code you get either from the app or texted to you – the point being that even if somebody knew your username and password, if they don’t have your phone they won’t be able to log in. I’ve enabled this on Google (Gmail, drive, etc), facebook, twitter, tumblr, Evernote, PayPal and anywhere else I could find that offers it too.